As long-time followers of my newspaper essays have known, I am passionate about the Yoruba language and have written about the pathetic state it has reached. 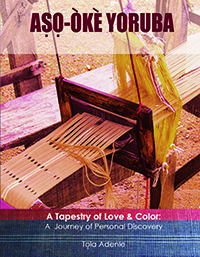 Yoruba as a disappearing language has been a topic I wrote about quite a few times, essays that have stressed what experts have harped on for a long time: that when a people lose their language or parts of it, they lose the most important part of their culture. Yoruba as “a disappearing language” has been essay topics a number of times and I’ve posted one here today. This app has been developed by one who should know the importance, though still very surprising that she did: born in the States, had first six years of her life in Nigeria, then back to the States where she grew up in a Yoruba-speaking home, high school in Nigeria where she took Yoruba up to High School Certificate and then back to the States for College but now lives in Europe. I think she brings to this project first, her love of the language PLUS the precision that an Engineering education to a doctorate level also enables her to do. I assisted – NOT as a part owner (!) – a bit, the same way I’ve been called upon by two graduate students in Nigeria to assist on their Yoruba research projects. Each time I get these mails, I feel a bit scared that some younger people are ascribing to me knowledge that I do not have simply from reading my newspaper columns because the highest level of formal Yoruba studies I had was to the GCE (Ordinary Level) in which I made an ordinary pass in January 1965! 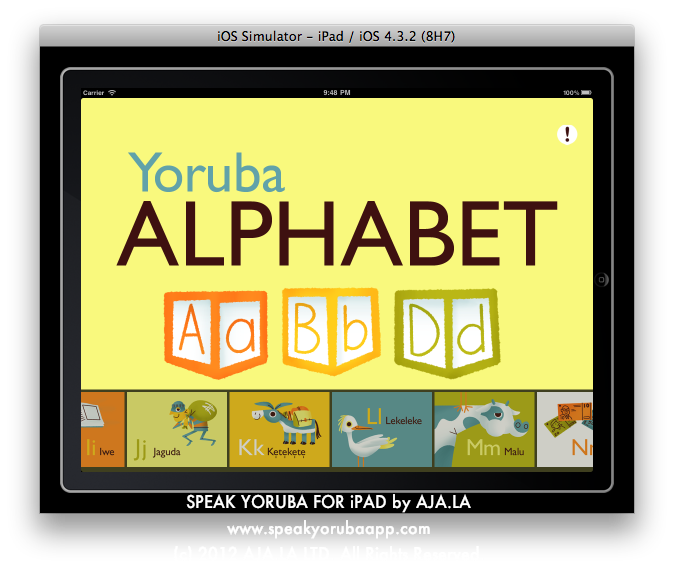 -The app includes an animated flash cards for one word of each letter of the Yoruba alphabet, along with English and Yoruba pronunciations. -The app was designed, published and produced by AJA.LA LTD.
It’s reassuring and heartening that quite a few young people are working on ensuring that Yoruba in Diaspora can raise their kids the way Ibos and Hausas, especially, raise their kids with their language widely spoken in their homes. This app naturally turns to modern tools. Visit the speakyorubaapp.com website today for a more than sneak preview. There should be something in this for me, eventually: Aja-La Ltd. will make the Ipetumodu Project of this Blog a priority on its Giving List! The developer of the apps, an Engineering PhD from Cambridge, is blogger’s daughter. TOLA ADENLE, Akure, February 9, 2012. AJA. LA ltd. should be congratulated for this. I’ve heard a thousand-and-one times how Yoruba expats in the western world would have loved their children to have a place where a smattering or rudiments of Yoruba language could be taught to their kids. It appears Aja.La ltd. has responded to this expats’ wish. When we were young, we learnt our alphabets from Chief J. F. Odunjo’s “ABD Olowe”. This earlier effort was further built upon by a magazine called Awo Rerin. AJA.LA ltd has taken the baton from these early attempts at furthering the speaking of Yoruba using the tools of the Information Age. What I would love to know is the origin of this name: does it have to do with ‘A’ – Aja – A for ‘dog’, or does the addition of ‘La’ mean something? I’m sure readers would love to know. A big congratulations to the people at AJA.LA ltd. behind this ‘app’. Thanks, Mr. Ajipeya. I’m sure readers must be wondering, too, at the meaning of your names, especially the first one. It is a descriptive Yoruba term for someone who calls his/her mother’s name first every morning using a very everyday translation. I’m sure all lovers of Yoruba language not only in the Diaspora but at home appreciates this effort from someone who’s from a generation we older people think of as not being interested in the language. Here’s wishing AJA.LA LTD. the very best in the endeavor, and hoping that this Yoruba app really does help in the preservation of Yoruba language. Thanks for your comments! The name AJA.LA is a stylized version of “Ajala” from Ebeneezer Obey’s song “Ajala travel, all over the world”! So far, we’ve received a really positive response to SpeakYoruba! I’d be happy to answer any questions anyone has before the official launch. Please send an email to info [at] ajalaco [dot] com. Thanks, AJA.LA Ltd. Now, I know. What I’ll do is post all the comments after this week so that everybody can check out the comments. Regards, TOLA. this is a great app and will soon be something a lot of us parents will not be able to do without! Thanks, Joksie. I agree it should become indispensable not only to home-abroad Yoruba parents but also to those interested in learning Yoruba language, especially as it will come packaged in a language younger Nigerians can relate to: download-able. Regards, TOLA. Though I am not a Yoruba language degree holder, I can contribute my quota to Ajala Ltd if she wants. She can reach me at tofadelight2002@aol.com. I will be willing to assist in the Yoruba numerals and others. Thanks. Thanks, Fatai. I’ll pass your message across. I’m not a degree holder, either but like you, graduate students have surprisingly been able to drink from what a love of the language has gifted me. Regards, TOLA. 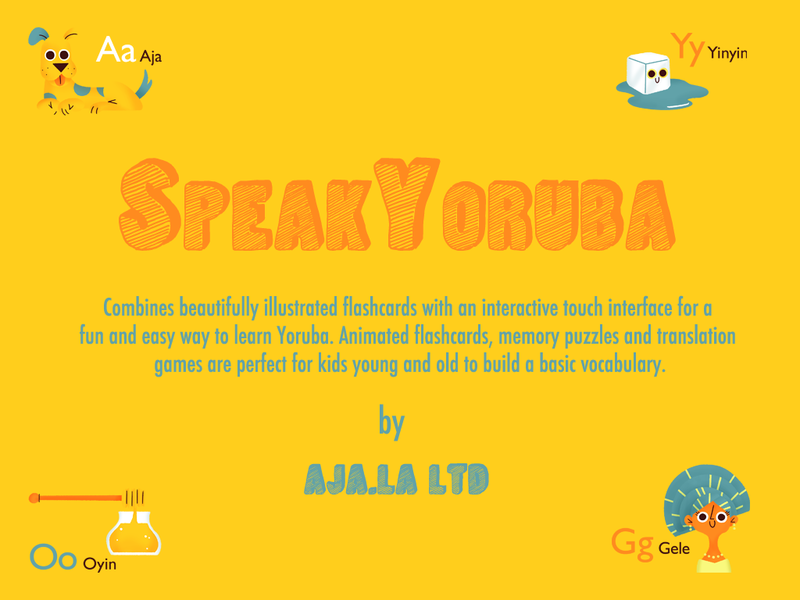 If anyone has any questions about SpeakYoruba, feel free to email info@ajalaco.com. Updates about the app will be available on http://www.speakyorubaapp.com. We are looking for beta testers, so if you own an iPad or iPhone and would be happy to fill in a questionnaire about the app in exchange for a free download, send an email to info@ajalaco.com. Thanks, dearest about Ipetumodu. L., M.